[Yudhisthhira said:] "Alas! Is he to suffer at last this tragic fate? Is this to be the reward for all the good in store for him? Can the consequence of years of good living suddenly turn into this calamitous end? It is laid down that those who die drowning, those who are killed by fall from trees, and those who die of snake-bite have a bad after-life. These are considered 'inauspicious deaths'; those whose deaths are such, become ghosts and have to suffer so, it is said. Why should this child end up like that? O, the horror of it, o, the injustice of the whole thing! ", lamented Yudhisthhira, biting his lips to suppress his sorrow. The brahmins hastened to console him. "Mahârâja! ", they interceded. "There is no reason to give way to grief. Such a great man will never meet with such a tragedy. No. In the horoscope of this child, studying the positions of the planets, we can clearly notice two happy conjunctions, which indicate vajra-yoga and bhakti-yoga, both powerful and propitious. Therefore, as soon as he learns of the curse, he will give up his kingdom as well as his wife and children and retire to the bank of the holy Bhagirathi river and surrender himself to the Lord. 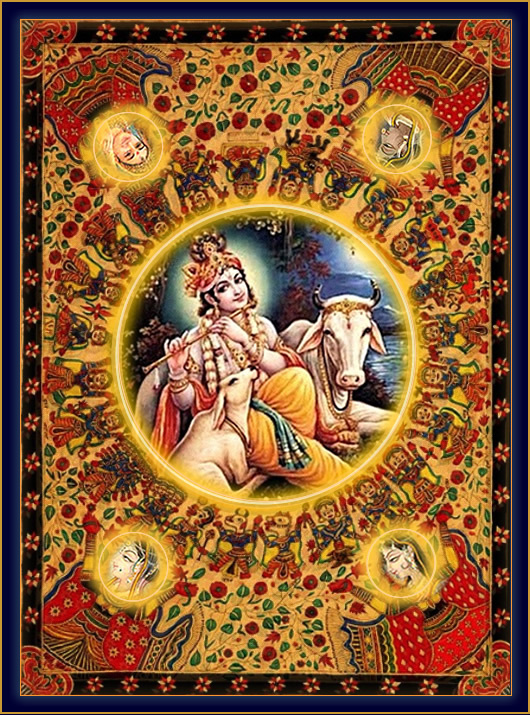 The great sage S'uka, son of Vyâsa, will arrive there and initiate him into âtma-jñâna (self-knowledge) through the recital of the glories of Lord Krishna and the singing of His praise. Thus, he will spend his last days on the sacred bank of the Ganga and breathe his last with the adoration of the Lord. How can such a man meet with any tragedy or calamity? He will not be born again, for, through bhakti-yoga, he will attain oneness with the Lord of All, Purushothama." Hearing these words, Yudhisthhira gave up grief and became happy. He said: "If so, this is no curse; it is a unique boon!" At this, every one rose. The brahmins were honored as befitted their learning and austerity. They were given gems and silken clothes and the king arranged to send them home. Yudhisthhira and his brothers moved into their palaces, but, they spent many hours talking about the happenings of the day and of the fears, luckily removed. They were filled with joy at the turn the predictions had taken. The baby grew in the lying-in-room as the moon in the bright half of the month. Since it was born as heir to the great empire, after a succession of dire dangers, every one loved it and guarded it like the apple of the eye, as the very breath of their lives. Draupadî who was broken by the loss of her own children, (the Upapândavas), Subhadrâ who had suffered inconsolable loss in the death of Abhimanyu, and the Pândava brothers who dreaded that the terrific sorrow of As'vatthâmâ directed against the posthumous child of Abhimanyu, still in the womb of Uttarâ, might do the worst and destroy for ever the Pândava line - all were relieved, nay, were overjoyed when they saw the child. They were supremely happy; they spent the days doting over the little lovely baby, whom they brought from the zenana for the purpose, whenever they felt the urge to see it and hold it in their arms. The child was very bright; it seemed to watch the lineaments of every one who fondled it or came before it. The child stared into their faces long and longingly. All were surprised at this strange behavior. Every person who came to it, was subjected to this searching examination by the child who seemed determined to trace someone or something in the world into which it was born. Some said, sadly, it is seeking its father Abhimanyu. Others said: "No, no, the child is searching for Lord Krishna." Some others opined that the child appeared to be trying to discover some divine brilliance. The fact remained that the child was examining all for some trait or sign which it knew already, to recognise some form it had in mind. 'Parîkcha' was the word used by every one for the 'quest' in which the child was engaged and so, even before the formal naming ceremony, every one both in the palace and outside it, began referring to the child as the Parîkchit, 'he who is engaged in Parîkcha!' That name, Parîkchit, stayed! From the râja to the ryot, from the scholar to the boor, from the monarch to the man-in-the-street, every one addressed the child as Parîkchit or referred to him so. The fame of the child grew from day to day. It was on every one's lips. One auspicious day, Yudhisthhira had the court priest brought before him and he commissioned him to fix a good day for the ceremony of naming the child-prince. The priest called together his group of scholars and astrologers and after consulting the conjunctions of heavenly bodies, they discovered a day which all of them agreed was a good one for the event. They also settled at what hour the actual naming had to take place. Invitations to attend the ceremony were sent to the rulers of the land and to scholars and pundits as well as prominent citizens. The king sent his emissaries to invite sages, and personages full of spiritual wealth. Arjuna went to Lord Krishna and reverentially prayed that He should shower His grace on the child on the occasion; Arjuna succeeded in bringing Krishna along when he returned. When Lord Krishna arrived, the sages, brahmins, râjas, subordinate rulers and citizens got ready to receive Him with respectful homage; the Pândava brothers attired magnificently, waited at the main gate of the palace to offer Him welcome. When the chariot of the Lord was sighted, drums sounded, trumpets pealed mighty welcome, and joyful 'Jais' rose from every throat. Yudhisthhira approached the chariot and embraced the Lord as soon as He alighted; he held Him by the hand and led Him into the palace, where a high throne was specially placed for Him. After the Lord was seated, all else occupied their seats according to their rank and status. Sahadeva [the twin-brother of Nakula] went to the inner apartments and the child was brought on a golden plate, resplendent as the sun and made more charming by magnificent jewels. The priests recited mantras, invoking the Gods to bless the child and confer on him health and happiness. Sahadeva laid the child down in the centre of the Court Hall. Maids and chamberlains came in long lines towards the place where the prince was, holding in their hands plates of gold full of perfumes and flowers, silks and brocades. Behind specially fitted curtains, the queens Rukminî, Draupadî, Subhadrâ and Uttarâ were rejoicing at the happy scene, watching the gambols of the child. Sahadeva took the child and placed it on a bed of flowers in the mantap that was erected for the naming ceremony. But, the child rose on all fours and started crawling bravely on, in spite of the remonstrances of the maids. Apparently, the child wanted to proceed somewhere! The efforts of Sahadeva to stop its journey proved futile. Yudhisthhira, who was observing its movements with interest said with a smile: "Sahadeva! Do not stand in the way. Leave him alone. Let us see what he does." And Sahadeva left his hold. He allowed the child to move wherever he liked but he took care to keep his eye always on him lest he fall or hurt himself. He followed him vigilantly at every step. The child, who got freedom of movement, soon made a bee line towards the place where Lord Krishna was seated, as if He was a long acquaintance whom he was seeking to meet. 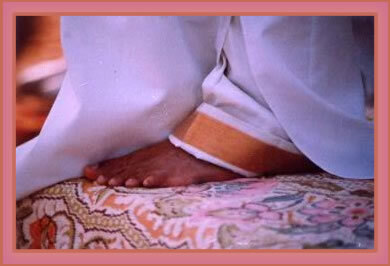 The child grasped the Feet of Krishna and pleaded, by his looks, that he may be taken onto the lap and fondled! The Lord saw his yearning; He laughed aloud; then, He graciously bent low to lift the child onto His lap. Sitting on His lap, the prince was staring at the Lord's face without even a wink; he did'n turn his head this way or that or pull at anything with his hands or make any sound. He just sat and stared. Everyone was amazed at this behavior, so unlike that of a child. Even Krishna shared in the feeling that pervaded the Hall. Turning to Yudhisthhira, Krishna said: "I did not believe when I was told that this child stared at everyone who came before him and examined their lineaments. I thought it was a new explanation given by these priests, to the usual prank and play of children. Now, this is really a wonder. The fellow has started examining even Me! Well, I shall test his behavior a little Myself." Then, the Lord tried to distract the attention of the child from Himself by placing before him a variety of toys, and Himself hiding from view. He expected that the child will soon forget Him. But, his attention was not drawn towards any other object. He had fixed his eye inexorably on the Lord Himself, and it was seeking Him and no other. He was trying to move towards the place where he imagined Krishna was. When His attempts to transfer the attention of the child from Himself failed, Krishna declared: "This is no ordinary child. He has won through My tests. So, the name Parîkchit is the most appropriate one for him. He already lives up to it!" At this, the pundits recited verses indicating their blessings on the child. The brahmins recited relevant passages from the Vedas. The music of trumpets rent the air. Women sang auspicious songs. The family preceptor dipped a nine-gemmed jewel in a golden cup of honey and wrote the name on the tongue of the child. In the rice grains spread on a golden plate, the name was written and the rice was then showered on the head of the child, in token of prosperity and happiness. The naming ceremony was thus celebrated in grand style. Men and women who attended were given presents as befitted their rank and they departed. Every one was talking appreciatively of the wonderful way in which the child sought out the lap of the Lord. Many praised the steady faith that the child had already attained. 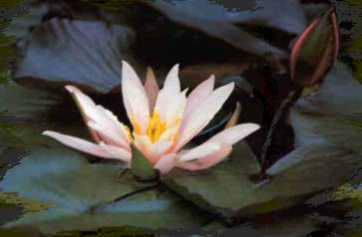 Yudhisthhira who was puzzled at the unique behavior of the child approached Vyâsa, the great sage, to know from him the reason for the strange search and learn about the consequences of this attitude. Vyâsa said: "Yudhisthhira! 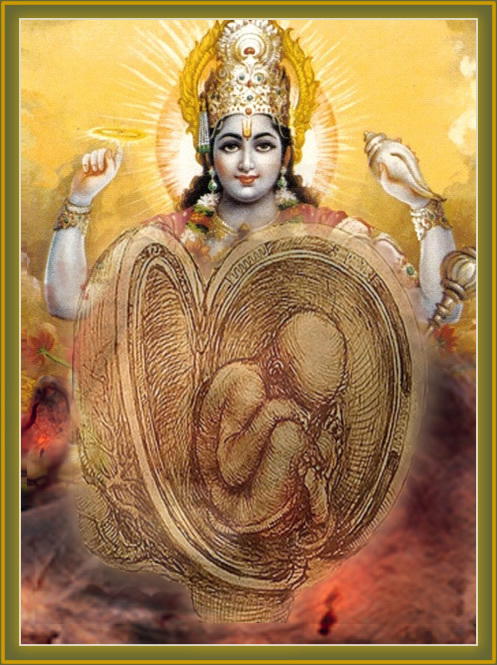 When this child was in the womb, the deadly arrow that As'vatthâmâ aimed at it in order to destroy it was about to hit its target; Lord Krishna entered the foetal home and made it safe and saved it from destruction. This child therefore has been eager to know who had saved him from within the womb where he lay. He started examining every one to find out whether he had the same effluence that he saw, while a foetus in the womb. Today, he saw that Divine Form with all its splendor and so, he moved straight towards Him and prayed to be taken up and seated on the lap. This is the explanation for the strange behavior about which you are curious to know." Hearing these words of Vyâsa, Yudhisthhira shed tears of joy and thankfulness. Overjoyed at the limitless grace of the Lord, he paid Him reverential homage. Source: Exoticindia.com. Used with permission. vintage image of Vishnu and an embryo study drawing by Leonardo daVinci.